The Scottish government has raised its target for sourcing electricity from renewable energy by 30 percentage points. Three years ago, it set out to achieve 50% from green power within 10 years. But new industry research suggested that the country's renewable energy potential was bigger than thought. First Minister Alex Salmond has now announced that the government is setting a new target of 80% of electricity from renewables by 2020. He said: "We are already on the path to a low carbon economy - Scotland gets nearly a quarter of its electricity from green sources. "Scotland is ideally placed to help lead the renewables revolution and taking account of the levels of planned investment over the next decade. "I believe it is now time to aim higher and to go further." An independent analysis was commissioned by Scottish Renewables into the country's renewable energy potential, which includes power drawn from wind, tidal, wave and hydro turbines, and energy from waste and biomass. It said the 2007 target of sourcing 50% of power needs from green sources within 10 years could easily be reached. It said it should reach 31% by next year, and there are several large projects which have already won approval and will come on stream after that. At a conservative estimate of increased generation and reduced demand, the country could have 81% renewable electricity within a decade, consultants Garrad Hassan claimed. With more ambitious assumptions about investment and consumption, renewables could provide 123% of Scotland's power needs. The surplus could be used for exports, requiring improved connectors out of Scotland. Those same cables could also be used for import of electricity from English and Welsh power stations when renewable production drops - for instance, when wind levels are low. 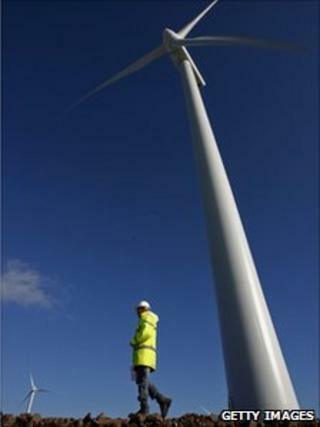 The report said onshore windfarms will continue to be required, with a doubling of the current number of turbines. While that faces opposition, much of that expansion can be through expansion of existing windfarms. The report does not calculate how this could impact on Scotland's target for reducing all harmful energy emissions including transport and heating. It assumes some extra demand for electricity from changes to the way homes are heated and from more electric cars on the road by 2020. The industry body said even reaching the 81% conservative estimate set out in the report would require effective and efficient consent procedures, or planning systems. It has called for improved grid connections and upgrades, reliable pricing systems to provide stability for investment, and infrastructure improvements to build the large scale offshore wind, wave and tidal farms that will be necessary. It said charges for access to the power grid should provide incentives for renewables. This is being addressed in a review by regulator Ofgem into the charges for grid access that are much higher in northern Scotland than southern England. Niall Stuart, chief executive of Renewables Scotland, said the 50% target set in 2007 was "dismissed as unachievable and unworkable at the time". He added: "But Scotland's renewable energy industry has grown massively over the last few years, putting us well on track to met his objective ahead of schedule." He said meeting the new target would mean "massive environmental, economic and social gains for our country - but it will require investment on a massive scale and concerted support from all levels of government".